The green 8x25 Wilderness Waterproof Binocular from Meade is a light and compact binocular that fits perfectly in a pack, bag, or pocket for quick glassing on the go in all weather conditions. A 65.6° wide-angle apparent field of view and anti-reflection fully multicoated optics provide expansive views that are bright and clear. Its nitrogen-filled optical tubes ensure that they won't fog with temperature fluctuation. This binocular features an o-ring sealed waterproof aluminium alloy housing that is covered with a ridged and textured rubberized armour to protect it from drops and impacts while providing a non-slip grip. The Wilderness is compact enough to be used one-handed, and the weight won't tire most people's arms for longer viewing sessions. The green 10x25 Wilderness Waterproof Binocular from Meade is a light and compact binocular that fits perfectly in a pack, bag, or pocket for quick glassing on the go in all weather conditions. A 63° wide-angle apparent field of view and anti-reflection fully multicoated optics provide expansive views that are bright and clear. Its nitrogen-filled optical tubes ensure that they won't fog with temperature fluctuation. This binocular features an o-ring sealed waterproof aluminium alloy housing that is covered with a ridged and textured rubberized armour to protect it from drops and impacts while providing a non-slip grip. The Wilderness is compact enough to be used one-handed, and the weight won't tire most people's arms for longer viewing sessions. The green 8x32 Wilderness Waterproof Binocular from Meade is a compact and versatile binocular that fits perfectly in a pack, bag, or can hang comfortably around the neck for quick glassing on the go in all weather conditions. A 68° apparent field of view and anti-reflection fully multicoated optics provide wide views that are bright and clear. Its nitrogen-filled optical tubes ensure that they won't fog with temperature fluctuation. The Wilderness binocular features an o-ring sealed waterproof aluminium alloy housing that is covered with a textured rubberized armour to protect it from drops and impacts while providing a non-slip grip. 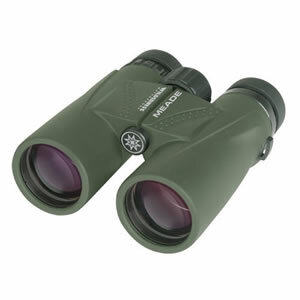 The green 10x32 Wilderness Waterproof Binocular from Meade is a compact and versatile binocular that fits perfectly in a pack, bag, or can hang comfortably around the neck for quick glassing on the go in all weather conditions. A 56° apparent field of view and anti-reflection fully multicoated optics provide wide views that are bright and clear. Its nitrogen-filled optical tubes ensure that they won't fog with temperature fluctuation. The Wilderness binocular features an o-ring sealed waterproof aluminium alloy housing that is covered with a textured rubberized armour to protect it from drops and impacts while providing a non-slip grip. 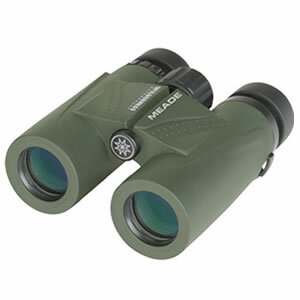 The green 8x42 Wilderness Waterproof Binocular from Meade combines BAK4 roof prisms and anti-reflection fully multicoated optics to create an optic that that will perform well from dawn to dusk and in all weather conditions. The lens coatings maximize the light that enters the 42mm objectives to produce images that are bright and clear, while the roof prism design minimizes the form factor to make it easier to pack and comfortable to hold. A 53.6° apparent field of view provide wide views on the trail, on the hunt, or at the stadium. Its nitrogen-filled optical tubes ensure that they won't fog with temperature fluctuation. The Wilderness binocular features an o-ring sealed waterproof aluminium alloy housing that is covered with a textured rubberized armour to protect it from drops and impacts while providing a non-slip grip. 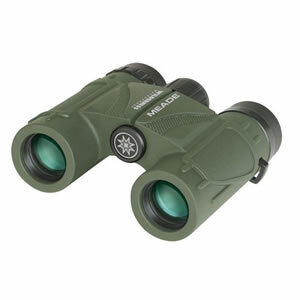 The green 10x42 Wilderness Waterproof Binocular from Meade combines BAK4 roof prisms and anti-reflection fully multicoated optics to create an optic that that will perform well from dawn to dusk and in all weather conditions. The lens coatings maximize the light that enters the 42mm objectives to produce images that are bright and clear, while the roof prism design minimizes the form factor to make it easier to pack and comfortable to hold. A 55° apparent field of view provide wide views on the trail, on the hunt, or at the stadium. Its nitrogen-filled optical tubes ensure that they won't fog with temperature fluctuation. The Wilderness binocular features an o-ring sealed waterproof aluminium alloy housing that is covered with a textured rubberized armour to protect it from drops and impacts while providing a non-slip grip.